Famous William Golding’s novel Lord of the Flies was written in 1954. Being a kind of parody for books of R.M. Ballantine’s The Coral Island (1858) sort, this tale of survival on a tropical island is a description of principal forces driving the development of society and a warning against the evil nesting in each human being. Golding’s intricate allegories and simplistic manner of speaking about bloodcurdling events make this book a representation of moral lessons that humankind still has to learn. In times of an unnamed war, a plane crash brings a group of British boys to a paradise-like tropical island, where they try to survive. William Golding furnishes this simple plot with details of relations in children’s group and quick deterioration of their upbringing while they have to find food, water, organize their life and face the unknown enemy. In Chapter 1, “The Sound of the Shell”, Ralph and Piggy, aged twelve or so, find themselves in a drastic situation: they are on the jungle-covered island and there are no grown-ups. Their conversation allows to conclude that they were on an evacuation plane with some other kids when it was attacked. They suppose that someone else could have survived the fall, so practical Piggy insists that they all should have a meeting and make a list of names. Ralph, fascinated by the island’s beauty and obviously still not comprehending the whole situation, goes to explore the landscape details, and spots something interesting: a shell. Piggy immediately showers him with chaotic information about this shell species – it is called conch, it’s very valuable and one of his friends used it as a trumpet and so on and so forth. They work together to get it, and Ralph tries to blow it. After several attempts he manages to get it going and make a tremendous sound, heard for several miles around. A sound like this would surely be heard and any plane crash survivors on this island should soon come to find out about it. Ralph continues to blow the conch and boys start emerging from the jungle one by one; their age varies from six to twelve. They gather in a comfortable place under palm trees and rest on fallen trunks. At last a whole chorus appears, keeping straight line and disciplined. It is led by Jack Merridew, another prominent character of the novel. He is a zealot of discipline and maintains it in his chorus even in these extreme circumstances. Even the fainting of one of the chorus members, Simon, does not distract him from his commander task. He is arrogant enough to propose himself as a chief, when kids decide to have one, just because he’s a head boy, a chapter chorister and can sing in C sharp. But kids decide to vote and simple raise of hands brings victory to Ralph. Observing Jack’s mortification, Ralph proposes him to stay in charge of his chorus. Jack even gladly states that the chorus should become an army or hunters. Ralph, Jack and Simon go to investigate the island, for nobody knows if this is an island at all. Piggy tries to follow them, but is sent back. Three explorers have a joyous walk, and climb the pink granite mountain top; now they know for sure that this is an uninhabited island. On their way back boys find a piglet stuck in creepers and Jack is ready to kill it with his knife, but the piglet manages to get free and escapes. Everybody is bewildered, imaging the blood-spilling as something enormous. Jack starts to boast that he was just choosing the right place and next time he would kill a pig. Ralph and Simon agree, trying to conceal their own bewilderment. Chapter 2, “Fire on the Mountain”, starts with a new meeting. Three explorers tell other kids about their discoveries. Ralph start to develop the major rules of behavior on the island. Jack looks happy when he hears about rules and discipline. A conch becomes a symbol of power, and the one who holds it can speak without interruption from anyone but Ralph. Piggy takes the conch and points out that nobody knows their location, and thus they may spend quite a long time on the island. Ralph, irritated, diverts everyone’s attention to the fact they are having a real adventure. At this moment one of the little boys takes a conch and asks older boys if they are going to do something about the “beastie”. He claims that he saw it in the night. Judging by description, it was only a nightmare, but boys are immediately immersed in a discussion of this issue. Older ones (soon to be referred as the “biguns”) try to persuade “littluns” that there is no beast on the island. This naturally leads to thoughts about rescue, and Ralph makes an essential proposition about the smoke signal. They should make a fire at some high point, so smoke will attract the attention of any ship passing by, and they all will be rescued. Jack immediately goes to mountain top to build a fire; boys are enthusiastic about this, so they follow him. Ralph is trying to maintain some order but quickly fails and follows the others. Piggy goes last, irritated by his comrades’ impulsive behavior. Boys build a large fire and use Piggy’s glasses to light it. The fire quickly burns out. Jack proposes his hunters as fire tenders. Piggy notices that they have started a forest fire and scolds others. Forest fire quickly consumes the area where some small kids were playing, and nobody ever sees again a little boy with a prominent birthmark on his face, who was the first to mention the “beast”. At this moment Ralph, bewildered, blames Piggy for not watching little ones, and Piggy, tired, retorts that he does not even know their number, because they keep scattering to play, swim or eat some fruits. Finally boys decide that small kids had just returned to pink granite platform. Chapter 3, “Huts on the Beach”, starts with a long description of Jack’s hunting: he had developed some tracking skills, but did not kill a pig yet, so when he returns to the meeting place, he is quite confused. He wants to hunt, but due to the fact that he does not succeed in it, everybody is skeptical about it. Ralph is not an exception; at the same time, he is busy with building shelters on the beach and tending the signal fire. However, Ralph is confused too: while all the boys agreed to build shelters, it’s actually only him and Simon involved in this work. Others and involved in their fun and games. Jack insists on the need to hunt, and Ralph is firm in his decision to keep the signal fire and build shelters. Later we find out that Simon has a secret place where he spends some time alone. He is careful at not being followed, so he diverts small kids by helping them to pick fruits and then goes into the midst of jungle, where vines form some sort of cozy cradle. Chapter 4, “Painted Faces and Long Hair”, starts with yet another one long depiction of boys’ daily activities. Littluns (as small kids are dubbed now) are busy with sand castles, but two hunters, Maurice and Roger, intentionally step on them. Jack invents a new hunting trick – a camouflage painting, for he suspects that pigs escape when seeing him. He uses colored clay and charcoal and now looks like a real savage. He takes all his hunters to the jungle, including the twins Samneric (Sam and Eric). The point is that they should give up their duty of fire tending, but Jack is adamant. Ralph spots a ship far away and is overflowed by hope, for people on the ship would surely see their smoke signal. Simon notices that there is no smoke, so he, Jack and Piggy hurry up the mountain, but to no avail: the ship is gone. Hunters arrive at the site, triumphant, with a pig carcass. Ralph blames them in leaving fire unattended, while Jack argues that they’ve got some meat. At last Jack gives a formal apology, but Ralph is still angry. Boys have their first feast on roasted pig, some reenact the hunting scene in a dance. Ralph calls an immediate meeting. Chapter 5, “Beast from Water”, starts with an evening assembly, where Ralph points out the non-observation of maintaining the fresh water stock, sanitary measures, plans of shelters building and tending the signal fire. After this he speaks again about the fear of the “beast” that continues to infest small kids. Jack takes the conch and states that he had explored nearly the whole island and never saw anything like that, so the beast does not exist. Piggy gives a brief explanation on psychology, trying to persuade everyone that the beast is only a figment of kids’ minds. When one of littluns, Percival, tells that he saw a beast last night, a horrible black creature prowling along the beach at the jungle edge, Simon shyly reveals that it was only him, heading to his secret place. Percival suggests that beast may come from the sea and immediately falls asleep. Simon tries to explain that they are carrying evil in themselves, but fails. His mentioning of spirits spurs the discussion about believing in ghosts and voting about it. The major part of boys does, so Piggy is sincerely angered with them. Jack is angered too, and openly confronts Ralph. He leads boys along the beach in a sort of heathen dance, and all efforts of Ralph to restore previous order are in vain. He does not even try to summon them back by conch trumpeting, for fear that nobody would come. Pleas of loyal Piggy and Simon have no effect. Suddenly the three boys are startled by unearthly wailing – it is Percival, who fell asleep and now had awaken to find himself alone. In Chapter 6, “Beast from Air”, the air battle takes place while boys are asleep. A pilot catapults but is killed in the air and lands on the island with his parachute entangled in vines. Cords fix his body in sitting position with its head down. At each wind gust the parachute flaps like monstrous wings and the body moves; it seems to be lifting its head. Twins, who are on duty at the fire, see it and run to the platform, shouting about the beast, exaggerated by darkness and their fear. In the morning Ralph calls yet another assembly to discuss the matter. They decide to explore the only unvisited part of the island, a granite rock that is nearly separated from the rest of the island, nicknamed the Castle Rock. While Piggy and kids remain at the beach, other boys conduct their investigation. Ralph goes to climb the Castle Rock by himself, Jack follows some minutes later. After not finding any beasts there, other boys join them, delighted by their new adventure, and want to play here for a while. Ralph insists that they should return and maintain their signal fire. Boys are reluctant but Ralph persists, so they go to the fire site, led by Jack. Chapter 7, “Shadows and Tall Trees”, starts with Ralph’s musings about being clean and well groomed. He is disappointed at realization that they all are dirty and their hair is uncut. These thoughts naturally lead him to weighting chances of rescue, which are pretty low now. While Ralph is staring into the sea, Simon comes to talk and gives a prophecy of sort, telling Ralph that he will come home. On their way to the mountain, after yet another unsuccessful hunt, boys are reenacting their hunters’ dance and the boy representing a pig is unintentionally hurt. Now the jungle slows them down. Simon volunteers to go back to Piggy to warn that others would not be back until nightfall. The investigation party reaches its goal after dark. Jack boasts that he will continue to search for the beast alone, so Ralph and Roger decide to go with him. Other boys leave, heading to platform. Jack continues his boasting and mocking, so Ralph, tired of this, taunts him to go on alone. Jack does exactly this and returns scared. Roger and Ralph try to find out the reason of his fright and are terrified too: they see an anthropoid creature with huge black eyes, and it’s moving. Investigators flee home. Chapter 8, “Gift for the Darkness”, starts with escalating conflict, when Ralph mentions to Piggy that even Jack was scared of the beast. Jack is angered, so he tries to raise the issue of impeachment. Boys refuse to vote against Ralph, so Jack runs off into jungle. Simon proposes to face the beast together, but everyone is just too scared to go. Piggy supplies a decision of their problem: instead of keeping the signal fire in proximity of the beast they can build it right here, on the beach. While they are busy with this, most boys escape to join Jack, and Simon goes to his secret place. Jack and his hunters gain another success by killing a nursing sow. They put its head on a stick as an offering to the beast. Accidentally they select an open place in clear view of Simon’s hiding. Simon has a hallucination and hears the pig head talking to him, revealing its name, the Lord of Flies. The talking pig head confirms the fact that Simon is already aware of: the evil, the beast is in themselves. Simon losses consciousness. Happy hunters realize that they have no fire, so Jack arranges the attack at Ralph’s followers (mostly littluns), steals burning branches and states that everyone who would join him will have a feast on meat. Ralph’s attempt to remind everyone about the need to keep the fire fails. In Chapter 9, “A View to a Death”. While the storm is building, Simon awakes from his fit and goes to see the beast. He recognizes the true nature of it and releases the body, so it would be still. Simon sees that boys are mostly in Jack’s camp at Castle Rock, so he heads here to reveal them the truth about the beast. His walk is slow, for he is exhausted. All the biguns are at Jack’s party now, so Ralph and Piggy go to Castle Rock too, driven by hunger and curiosity. Jack, behaving like a real tribal chief, generously allows them to eat, and when everyone is stuffed, asks them if they would join his tribe or stay with Ralph. Tension becomes unbearable but the storm is breaking, so boys are frightened and nobody cares about election. Jack commands to dance, and everyone joins in, even Ralph and Piggy. In their frenzy boys take Simon, who comes into their circle and starts to shout something about the dead body, to be the beast himself, for everybody is terrified and Simon’s voice cannot be heard in the storm. Scared and hypnotized by their own chanting, boys kill Simon and retreat because of the rain strengthens. His body is left on the beach and washed away by night tide. Storm wind fills the parachute and the dead body is carried over the island and into the sea. Boys are scared and run away, screaming. In Chapter 10, “The Shell and the Glasses”, Ralph, Piggy and Samneric are the last biguns left on the beach. They are still scared and ashamed of the last night’s events and try to persuade each other and themselves that they were not involved in murder. Piggy insists on calling this an “accident”, for nobody was trying to kill Simon purposely. Jack enjoys his dictatorship, amusing himself by tying and beating one of those who angered him somehow. Their fire went off in the rain, so they need to steal more burning branches. Along with this strategy development Jack also tries to persuade his tribe members that they did not kill the beast, just beaten it hard. Moreover, he says the beast came to Castle Rock in disguise and is capable to change its appearance; this calms them down a little, diverting their thoughts from the fact that they killed one of their own kind. During this planning and theological discussion, Ralph and his followers decide to keep the fire burning only at daytime, because smoke is invisible at nights, but mostly because there is not enough boys capable to supply the necessary wood for burning: Sam and Eric are already exhausted and Piggy was physically weak from the very beginning, being fat and suffering from asthma. Jack’s plan to steal burning branches fails, so instead he and two other boys steal Piggy’s glasses. At the beginning of Chapter 11, “The Castle Rock”, Piggy urges Ralph to call a meeting by trumpeting the conch. It seems ridiculous, but it is an orderly thing to do. The remaining biguns make a decision to visit the savage tribe at Castle Rock in order to remind others about the signal fire and retrieve Piggy’s glasses, for he is nearly blind without them. Samneric are scared but follow nevertheless. Jack’s heathens are teasing them and Roger even throws stones at Samneric. Jack returns from hunt and tells Ralph to go back in his part of the island. Ralph call him a thief for stealing Piggy’s glasses and a brief dueling on spears follows. Piggy interrupts them by reminding of their purpose. Ralph says again about the need of signal fire, but savages only laugh. Jack orders his army to grab twins and tie them. This spurs a fistfight between him and Ralph. Piggy interrupts again, stating that he holds the conch and thus has a right to speak. He scorns his mates about their savagery and childish behavior when Roger purposely releases a huge boulder in his direction. Piggy is killed on the spot, his crushed body falls on cliffs and is immediately washed into the sea. Somebody throws a spear at Ralph and he flees. In Chapter 12, “Cry of the Hunters”, Ralph returns to the platform. Facing the perspective to spend the night alone in his shelter, he decides to return to Castle Rock and try to persuade savages once more. On his way, he sees the rotten pig’s head that has spoken to Simon. This sight disgusts and scares Ralph, so he knocks it on the ground and takes its stake with him as a weapon. Approaching Castle Rock, he runs into Samneric being on the watch. They tell Ralph that Jack’s savages have planned the manhunt and hint that upon seizing Ralph, he will be beheaded and his head will become yet another offering to the beast. Next day a promised manhunt begins. Savages are chasing Ralph through the whole island, throw several boulders to kill him or make him leave his hiding place and finally set the island forest on fire, never thinking about what they will eat tomorrow. Ralph desperately tries to outrun both the tribe and the fire and reaches the beach. Here he stumbles into a British naval officer in full regalia. A huge fire lighted by the tribe had at last fulfilled an essential function – the grownups finally arrive to rescue the children. The officer scorns Ralph, collapsed at his feet, and others, reminding them that they are British boys. Now everything seems to be falling in place: there are no savages, there are only children, dirty and malnourished. While this seems to be a happy ending, Ralph starts sobbing over everything he had lost, while officer looks awkwardly at his ship. Ralph is a perfect British boy, decently educated, charismatic and handsome, diplomatic, responsible and civilized. Golding, with his tendency to use the fable structure, gives him a description that nearly matches Prince Charming from some fairy tale, but this “prince” in only twelve years old, so, being smart and diplomatic, he is also just a child. He is able to concentrate on main issues, like the signal fire or shelters, but fails to keep others properly organized and just cannot keep everything in mind, lacking training and experience of adults. This eventually leads to the degradation of his authority. While collapsing at the feet of a British naval officer, Ralph is crying not because he is saved from certain death, but he weeps over his gone innocence, as Golding gently puts it, meaning the discovery of evil lurking in everyone. Jack Merridew, a chapter chorister, a head boy and, later, a chief of a savage tribe, is an embodiment of evil and violence. The author even gives him red hair, a sign of evil presence in medieval times. He is a zealot of discipline and punishment for rules breaking, but he is nearly the first to break them. Jack’s inclination to hunting shows his wickedness, because, besides having good and practical reasons for it, he enjoys the power over someone’s life too. His skills in hunting and rhetoric win him the loyalty of nearly everyone. He develops into a true tribal chief and dictator, his savages are ready to follow him even into a conscious homicide, and only the arrival of adults puts him back into a place of a twelve-year child, where he belongs in spite of his cruelty and possible madness. The true name of this smart and intelligent boy remains unknown. He is fat, myopic and suffers from asthma, so other boys feel safe to tease him as they wish. In the novel Piggy represents rationality and wisdom. He also possess the best vocabulary. Not capable to be a leader himself, he becomes a consultant and confident of Ralph, taking this for a friendship. Piggy fails in understanding others’ intentions and feelings, and is sure that everyone should think like him: for example, during the Jack’s raid he assumes that they came to steal the conch, while far more practical savages came to grab some burning branches. He often scolds his mates, stating that they behave like kids, reminding about the discussed or pressing matters, and even tries to get them briefed in psychology, when everyone is scared of the beast. When his glasses is stolen, his sureness in common values leads him to claiming justice and consequential death. Faithful to fable structure, Golding had distinguished yet another prominent character, Simon, representing spirituality. Simon frequently faints and possibly suffers from a mild form of epilepsy. In Golding’s depiction, he is a visionary and even a prophet of a sort. He is curious, bright-eyed and thoughtful, as well as probably the only one of biguns who cares about littluns by helping them to pick better fruits. Simon likes to be alone, meditating in his hiding place. Other boys think him to be odd, and they are right about it to some degree. Simon has a deep understanding of nature of things, but, being a child and a kind of visionary, is unable to find the words to convey his knowledge. This understanding made him brave enough to explore the beast by himself – an act of true boldness, given his age and physical frailty, not to mention his recent hallucinatory encounter with the Lord of Flies. Simon ends his life like a true prophet, killed by mad savages while attempting to share a revelation with them. The twins represent civilized individuals, easily submitting to collective will. Being well-intended, they are just willing to play by the rules of a person in charge, no matter what these rules are. When they are captured by Jack’s tribe, Samneric almost at once become loyal to him, fearing for their lives. They are an example of characters that would easily slip back into civilization: there is just a set of rules that should be properly observed, and everything is going to be fine. Cruel and sadistic, Roger does not dream about the leadership and subordinates. He simply likes to hurt. Jack’s dictatorship allows him to unleash his primitive impulses, so he perfectly fits into the position of a hangman and torturer. Any conditioning of civilization slips off him too easily, so he is probably even more evil and mad than Jack. The main theme of Lord of the Flies is evil in human nature. According to pessimistic opinion of Golding, humans are evil and even barbaric, and only a thin film of civilization prevents them from falling back into savagery. Another important theme is violence. A former school teacher, William Golding was familiar with many unpleasant aspects in behavior of well-educated children. So, in the setting of the novel, Golding undertakes an analysis of violence and its outlets (Jack’s love to hunting or tribal reenactment dances that help to channel the excess of emotions). One more theme is fear and its effects; it is represented by the whole situation concerning the beast and its exploration. Fear is contagious and opens the way to the weirdest of possible beliefs and superstitions (the well-educated British boys are offering a pig to the mystical beast); it even causes the murder of Simon, possibly the bravest boy of them all. A fine example of the primitive way of thinking still present in contemporary human minds: the mask is something separate and a way of hiding simultaneously. Jack separates his savage part into a mask, because without it he would still behave in a more or less civilized way. A great clamor rose among the savages. Piggy shouted again. Here Piggy is at his best: he tries to tell a wise thing, to remind boys about the sensibility and civilized behavior, but gains quite an opposite effect, for being Indians is much more interesting than being like Ralph. Golding, who wrote Lord of the Flies, once stated that the theme of his book was grief, grief, grief. This quote just confirms it. Golding’s former occupation shows: it is not natural for children to obey any rules, but civilized upbringing would teach them obedience. This is probably the first stage of losing child’s innocence for Ralph: now he is capable of analyzing the evolution of his attitude towards reality and life. 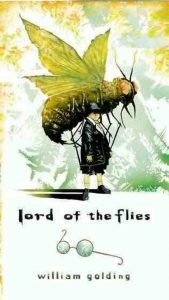 Lord of the Flies is full of biblical references, starting from the title, which is a translation of the name of Beelzebub, a prince of the demons. The conch is also one of the most prominent symbols, almost equal to royal regalia in the boys’ society. The conch represents order, being a way to call countless assemblies for the discussion of important matters. It also is a sign of civilized behavior. Bright at first, covered with ornaments, it slowly fades under the sunlight, just like the boys’ strive to order does, and when it is broken at the moment of Piggy’s death, this marks the point of no return. Fire is another significant symbol of dualistic nature: it gives a chance for rescue, but it also acts as a destructive force, setting the island ablaze. The Beast is a simple but impressive representation of evil, fear and darkness. There is no actual beast on the island, the monster exists only in imagination of kids, but a beast lurking in everyone’s soul is far more hostile than any animal one could encounter in this world. Body paint – symbol of hiding and false identity. Jack uses it for practical reasons, but almost immediately feels its somehow liberating effect. This is not him now, it is a mask. As it turned out, the paint did not hide boys’ identities, it just revealed them completely. Another interpretation of the title is “the power of corruption” (lord stands for power and flies represent decay). Lord of the Flies was adapted into a movie twice – in 1963 and 1990. It was named one of the 100 Best Novels in the Modern Library, reaching number 41 on the editor’s list, and 25 on the reader’s list. In 2005 Time magazine named it as one of the 100 best English-language novels from 1923 to 2005. Sir William Gerard Golding (1911-1993) was a British novelist and poet, a Nobel Prize laureate in Literature (1983). During World War II he served in Royal Navy and participated in D-Day in Normandy. His first novel, the famous Lord of the Flies, was published in 1954. Following the publication of his best-known work, Lord of the Flies, Golding was granted membership in the Royal Society of Literature in 1955. Ten years later, he received the honorary designation of a Commander of the British Empire (CBE) and was knighted in 1988. His 1980 novel Rites of Passage won the Booker Prize, a prestigious British award.